Crowley Maritime Corporation is a U.S.-owned-and-operated marine solutions, transportation and logistics company providing services in domestic and international markets. Crowley is a complex organization made up of six business units with approximately 6,000 employees. It operates in over seven countries for over two billion dollars in annual revenue. In the Spring of 2015, Crowley recognized that its acquisition, technology transformation and business transformation strategies would involve a lot of change. Further, leadership recognized that the organization’s bias toward immediate action, while important in achieving company goals, made change even more difficult. They resolved to invest in making change happen more easily and quickly throughout the organization. “Prosci has been a critical partner for Crowley as we build our internal change management competence. We invited Prosci to meet with our senior leaders to help us realize the benefits of effectively managing the people side of change within our most critical business initiatives. "They have been instrumental in supporting our efforts to build a full enterprise change capability, including structure, training, tools and advisory services support. Most importantly, they have helped us set a strategy and roadmap that we can use for years to come." To build enterprise change agility that would enable large-scale change to happen more quickly and effectively throughout the organization. Just one year into their aggressive four-year plan for implementing an organizational change capability, the Crowley leadership and CL team had exceeded expectations on their progress. After establishing a baseline change management maturity score of 1.8 in 2015 based on Prosci’s five-point Change Management Maturity Audit scale, they targeted an improvement to 2.1 as the goal in 2016. They exceeded this target in every capability area measured, ending the year with a change management maturity score of 3.0. 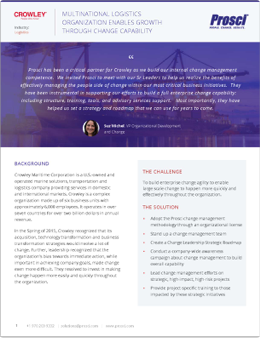 Learn how the Crowley change leadership team selected four projects to initially apply change management to, and discover more about their impressive results, by clicking the lick below to download the story. Crowley recognized that its acquisition, technology transformation and business transformation strategies would involve significant change. The company resolved to invest in making change happen more easily and quickly throughout the organization.